Went over to a friend's place at Lonavla to spend the day with school friends.I don't think we ever talk of food then.The Queen Mary School lunch was great though....Mallu cooks supervised by Parsi teachers with dishes like pattice and tomato gravy,ravo,biryani and bottle gourd bhaaji. One food memory I distinctly have is of boiled potatoes with red chili powder and salt that my friend Misbah would get. Some I had been in touch with and some had moved abroad and lost in touch.We were here to discover where life had taken each of us. Namita who hosted us is a fitness expert.She has written several books and newspaper columns on the same and conducts classes at Colaba.Niloufer and I used to write inland letters to each other in childhood when smses and email did not exist.Don't try guessing our age ;) She left me stumped with her list of best dishes in Mumbai as did Manisha.To think we had never discussed this before! 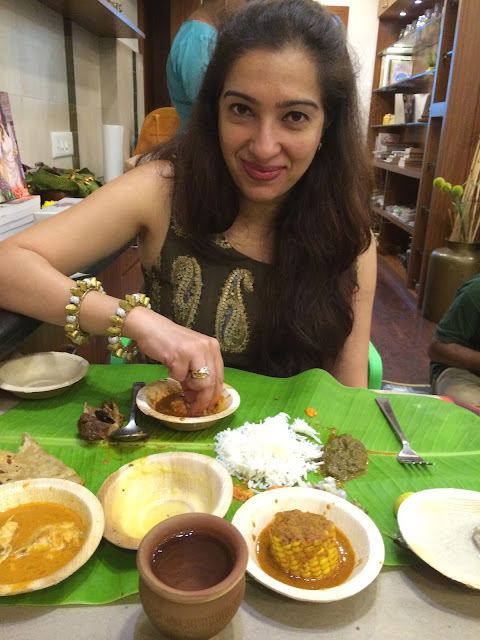 Trishala, the most fashionable of the lot,loves Malvani food. and Khichdi.Not to forget my favoutire....corn canapés! All immensely delicious!! Yeah,me the pucca nonveg saying that!! Manisha, you are awesome at capturing the days mood, food and emotions... what an interesting read... thank you! Lovely write up and great pictures. Hi Manisha, would you happen to know where in Mumbai I can buy these brass vessels from? I have lived away from Mumbai for a decade so am completely out of touch and will be visiting end of the month.Thanks! Fresh Betel nut leaves . What a treat !